Molly, the playful pooch in our latest takeout commercials, has been stealing the show here at Eat'n Park. So, we asked, "Who's stealing the show in your household?" We were overwhelmed by adorable pets of all shapes and sizes, but out of all of those submissions, we narrowed the field down to a dozen. Now it's your turn - help us crown a winner! 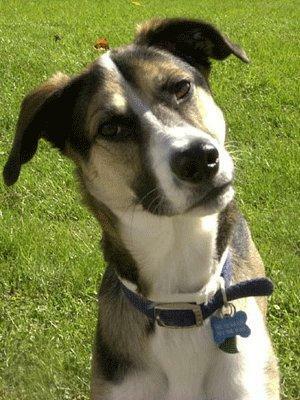 Take a look at our finalists below, then go here to vote on your favorite: http://bit.ly/ENPpets. We'll announce the winner on Friday, March 16. 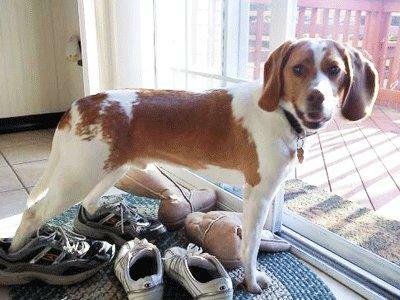 From his human: "Bentley always tries to steal the show in our house! Whenever we're getting ready to go in the car, including when we're going to get Eat'n Park for dinner, he thinks he should come too & waits expectantly at the door. In this picture, he thought he was going with us and just happened to step right into my husband's shoes, as if he were one of the humans! From her human: "Izzy is a two year old basenji. I rescued her when she was six weeks old. She loves chewing anything and everything. She also enjoys smiley cookies!" From his human: "I couldn't believe Zeke stayed in place while I ran to get my camera for this shot. 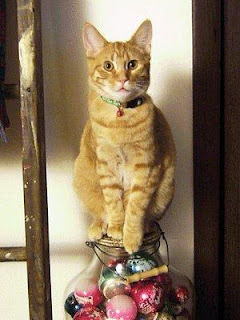 He remained perfectly balanced on the antique milk jug filled with antique Christmas ornaments while I snapped away. What a pretty boy!" From her human: "We adopted Mushka from the Humane Society 2 years ago. We went to the Home Show and she was there with the Humane Society. She entered our hearts and we couldn't walk away without adopting her. She is the most easy going and cuddly dog I have ever owned and gets along with our other dog Lola Bean (who is in the background of the photo). 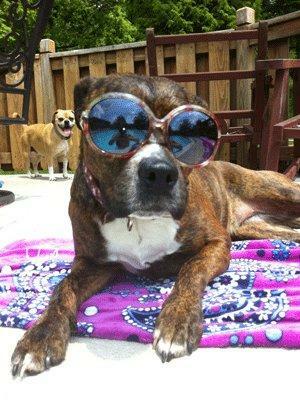 She likes to lay on the pool deck when we are swimming and as you can see thinks she is a star!" From his human: "Happy is just that - always Happy! Particularly when he's enjoying the outdoors or playing with little ones. Happy also has a refined taste in food - no potatoes for this dog! The intelligent canine that he is, he knows better! He prefers eggs with cheese, pasta sauce, and restaurant-breaded chicken." From her human: "Silly BB is always doing something to make me laugh! 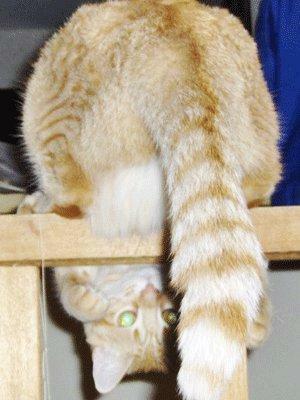 In this photo, she has discovered that she can reach her tail around the railing. She's quite an athlete, catching toy mice in midair with her claws, & racing like a wildcat up & down the hallway." From his human: "Along with his smiley cookie, Max enjoys drinking some coffee! 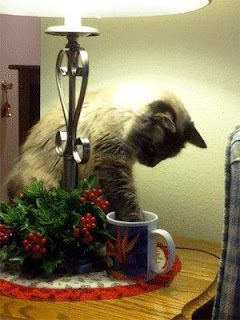 Every morning, he repeatedly dunks his paw into my cup of black coffee and licks it clean!" 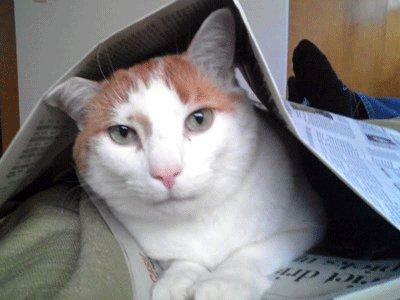 From his human: "It was fate when my husband and I went to the Western PA Humane Society on April 22, 2010. 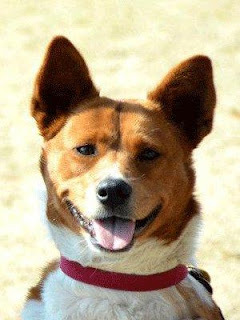 We went there to possibly bring home one dog we had seen on their website, but Linus captured our hearts....the rest is history! Since we adopted Linus, he has become a certified therapy dog and makes bimonthly visits to the Cedars of Monroeville Senior Living facility. Don't let his therapy dog status fool you! Linus has found himself in quite a bit of trouble on numerous occasions, usually involving letting his nose for people food leading him there. Linus was able to independently figure out how to use the bar stools under our kitchen counter as a way to get to food on the counter as well as on top of the fridge....yes, Linus even figured out how to get food down from the top of our fridge! Linus has brought so much joy and laughter into our lives. 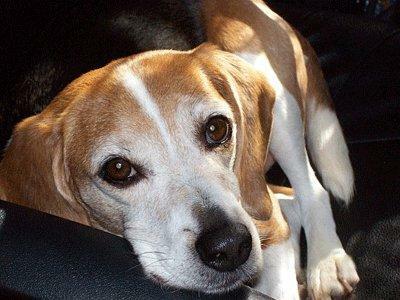 Sometimes I think it was Linus who rescued us and not vice versa!" From his human: "Our cat, Rags, definitely lives on his own terms. As you can see, we can't even enjoy a cup of coffee and read the Sunday paper! He never ceases to make us laugh...if he's not trying to read the paper himself, he's darting out from behind a door in order to scare our two large dogs! And he usually does!" 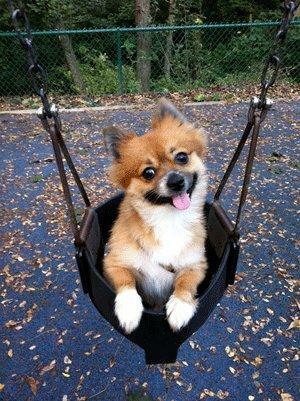 From his human: "This is a picture of my 3 year old Pomeranian in a child's swing. It seemed like a good idea to see if he wanted to swing, and it turns out that he loved it! But that isn't the only thing that makes Scrappy happy, contrary to his name, he always seems to have a permeant smile on his face. He is just one happy dog! Scrappy makes me Smile!" 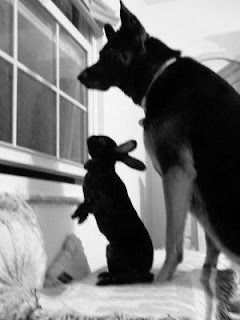 From their human: "Miss Addie and Bella Bunny always got along so well and it made it smile, especially since everyone told me not to adopt a bunny with such a large dog." 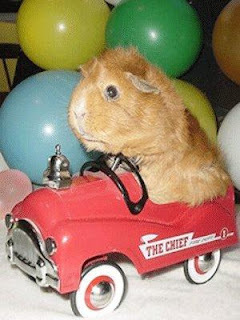 From his human: "My husband was a volunteer fireman for 50 years. Here Caesar wanted to carry on the family tradition!"